ELMHURST – Calling it the “Mount Rushmore of Elmhurst”, mayor Steve Morley told reporters gathered just outside the entrance to the Chicago-Elmhurst Stone Co. Monday afternoon that the city has commissioned The Elmhurst Artists’ Guild to create a monument dedicated to local heroes by sculpting the likenesses of legendary York High School Cross Country coach Joe Newton and the five members of the hometown rock band “The Orwells” into the upper north wall of the quarry’s east lobe. 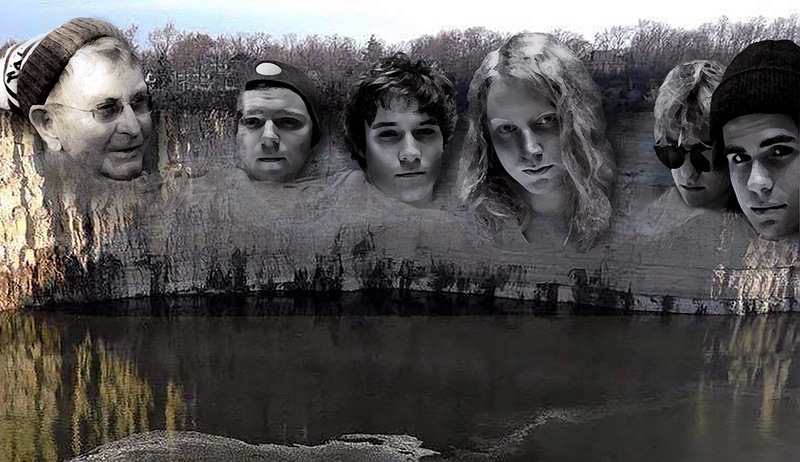 The project – which will feature 75-foot tall faces of Newton and each of The Orwells – is the brainchild of EAG president Cassandra Swierenga and is intended to honor the achievements of Elmhurst natives and those who have worked in or served the community. The recent announcement of Newton’s retirement from coaching inspired Swierenga to come up with the idea. Mayor Morley said that it didn’t take long for him to sign off on the historic monument. Sculpting of the monument will begin next spring and is expected to be completed by August. There must be other ways to spend tax payer money! Also others in Elmhurst history more worthy than the Orwells! Great Man & a more deserved award to one of your community that touched the livesw of so many of your kids that have gone on to be successful in business, life and members of other communities..including Elmhurst. I coached & taught in Stevens Point, Wisconsin. Joe touched my life & I have been a willing “participant” in sharing his motivation, leadership & education for kids from Wisconsin and now Arizona. I am one – Joe has reached hundreds of parents, coaches and kids all over the country. This is a wonderful tribute to the ultimate compliment one can pay to any person -” Joe Newton symbolizes EDUCATION at it’s highest level.” He is loved & respected all over the country. I’ll be there when the monument is dedicated if there is any way possible. Thank you Elmhurst for recognizing his contributions to society & community. I’ve never heard of The Orwell’s. There are definately more Elmhurst people with more importance. Carl Sandberg, Henry Gloss, Ludwig and Julius Graue to name a few. Rand and George: I’m afraid you’ve both fallen for a piece from my satirical blog “The Elmhurst Funion”. The blog is half “The Onion” (but for Elmhurst), and half satirical takes on actual Elmhurst news. This story is completely made up. After Joe Newton announced that this upcoming year will be his last at York, I wanted to write something that had to do with him. This is what I came up with. Rand: Although your kind words about Newton and how he has affected how you coached and taught were seemingly “all for naught”, I loved reading your thoughts nonetheless. I’m an ’86 grad of York, and I had Newton as my gym teacher a couple of times. I’ll tell people forever that my biggest regret of my teen years was not running cross country for him. Pat: The Orwells are a rock band out of Elmhurst that has gained national attention over the last year or so. Rolling Stone magazine has written about them, and the band has played on the Dave Letterman show twice now. You’re right that there are more “worthy” candidates for such a monument, if one were really being built. But I went with The Orwells for the humor angle. Newton and a rock band are great contradictions for “Mount Elmhurst”. Thanks for reading the post guys, and best wishes.